Ajay Arora, sub divisional magistrate of Almora district, is among five people feared dead in rain-related incidents in Uttarakhand where heavy downpour on Wednesday damaged roads and swept away a number of homes. Four members of a family were among those confirmed killed. Arora slipped off the makeshift bridge and fell into the Mandakini river which was is spate following heavy rains in Rudraprayag district, officials said. Arora was returning to the Garurchatti base camp when the mishap occurred, they said adding the river is being combed to trace the official. 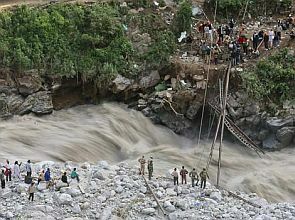 Four persons were swept away in a cloudburst following heavy rains in Kapkot division of Bageshwar district. Kapkot SDM Kailash Singh Tolia, who rushed to the spot, said the four persons seem to have flown down a nearby canal and efforts are on to locate them. 125 mm of rains were recorded in Kapkot division during the past 24 hours, leaving Saryu and Gomti rivers, which flow through the area, in spate. The rivers are flowing just below the danger mark. Earlier, four members of a family were killed in their sleep in a slum area in Rajpur road of Dehradun when early morning rains caused a landslide in a nearby hill and boulders fell over their slum flattening it, police said. Heavy rains that continued for about an hour threw normal life out of gear in the city and left the roads heavily waterlogged, police said. Most places were lashed by heavy rains in the state, and over a dozen houses and two roads were badly damaged in a cloudburst in Uttarkashi district, where cracks have appeared in a large number of residential buildings. While a stretch of Rishikesh-Gangotri National Highway at Gangnani was washed away by the swirling waters of Bhagirathi, Uttarkashi-Dunda road was damaged at a number of places, officials said. Nine houses were damaged in a landslide triggered by heavy rains in Salt division of Almora district. Two houses were also damaged in cloudbursts at Pipli Dhanadi and Atadi villages in Uttarkashi district, where 90 mm of rains have been recorded during the past 24 hours. Landslides have brought debris onto several roads across the state, disrupting the traffic movement. IN PICS: Temples of India!